The Palau Blaugrana could not have said goodbye to the departing Jesper Noddesbo and Kiril Lazarov in better fashion. Another win for Xavi Pascual’s team means they have now gone four seasons in the league without defeat although they were made to work hard for the most recent win with seventh placed Huesca only succumbing to a 30-29 defeat in the final minutes. The first half was a topsy turvy affair with the visitors racing into the lead only to be pegged back by the blaugranes at 10-9 thanks to a goal from Ariño in his 400th appearance in the league. Nevertheless, Huesca managed to nose back in front at half time at 16-15. The second half began in similar fashion with Barça being made to work hard. 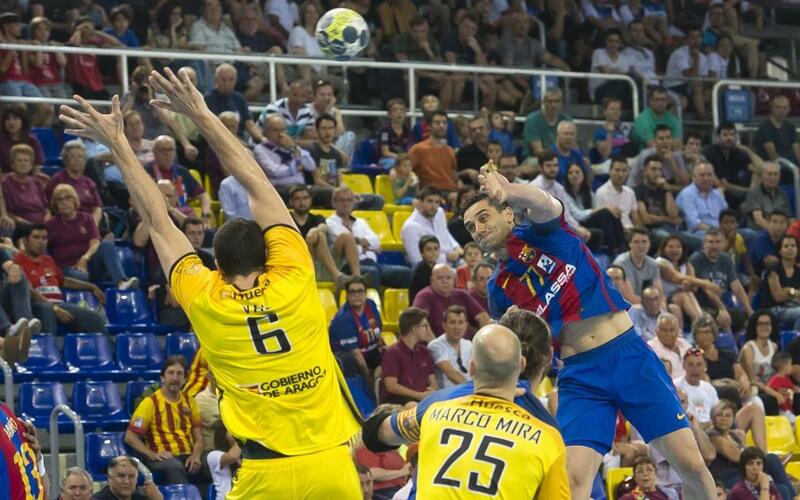 Huesca again took the lead and at 25-22, the visitors were threatening the blaugranes perfect season. However, Ariño appeared again to nudge the home team ahead again and Entrerríos seasled the victory by 30-29. Before the game there was a tribute to Noddesbo and Lazarov who will be leaving the club at the end of the season. Now all eyes turn to Cologne in Germany where Barça Lassa will take place in the Champions League Final Four next week.